Have specific questions about our premium line of play sets? Chances are you will find your answer below. Can you install a swing set in my area? Kid’s Creations optional installation is available in most markets within the contiguous US. Click here and enter your zip code to determine if you’re within our installation service range. We only install models purchased through Kid’s Creations. Do you have a showroom in my area to physically see your sets? Kid’s Creations primarily sells online, shipping directly from our manufacturing facility direct to your home…this allows us to provide you with the lowest prices and best values. We do have a handful of showrooms in select markets. Click here to see a list of our showrooms. How level does my ground need to be? We recommend the ground to be level within 3 inches. Will Kid’s Creations Installers adjust my set if it’s out of level more than 3 inches? Unfortunately, Kid’s Creations does not offer excavating, but we can level a set up to 3". Do you sell individual parts for your sets? Yes, Kid’s Creations sells various accessories that are compatible with our models. What tools will I need to complete the installation? I ordered my set a few weeks ago, when should I expect it to arrive? Lead time on delivery and/or installation is usually 3-4 weeks from order date. Please contact Customer Service regarding your specific order, as lead times may vary during peak season and holidays. 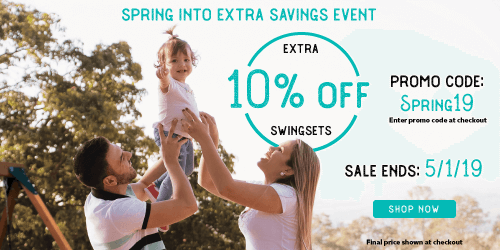 How much does it cost to install your swing sets? What material are your roofs made with? Our swing sets feature either a heavy-duty vinyl canopy or a durable wood roof depending on the series and model selected. Within our Premier Redwood Series you can choose between two colors of heavy-duty vinyl canopies or two wood roof options. Do you offer payment plans of your models? All purchases are required to be paid in full at the time of order. Kid's Creations accepts all major credit cards. What is the warranty on your models? 1-year warranty on ropes and vinyl canopies. Can I add something to a set at a later date? Yes, orders can be revised prior to shipping, but may extend the ship date based on the amount of changes. Please contact customer service regarding adding new options to an older model to determine compatibility. Can the swings and accessories be changed out easily? Yes, our swings, trapeze and other swing beam activities are connected using "quick clips" which allows for easy changes. How long until I have to replace the vinyl canopy? Vinyl canopy replacement will vary depending on how much sun and wind it gets exposed to. We recommend removing the vinyl canopy during the winter to extend the life of the product. Can I choose the color of my swing set options? Kid's Creations “Design Your Own” feature allows you to choose your features, activities and colors to create your own customer swing set. Click here to start designing your perfect swing set. My set has some cracks in the wood. Can I get it replaced? Small cracks or “checking” is naturally occurring in all types of wood species used outdoors and does not effect the strength or durability of the wood. However, if you have a particular piece you have a question about please give us a call. Can I put a tire swing under the Circus set? Are swing set components pre-assembled? Kid’s Creation swing sets feature pre-cut and pre-drilled wood components for easily Do-It-Yourself assembly. Our Premier Redwood series swing sets feature factory-assembled ladders and railing sections for easier assembling. Check out our posted instruction manuals online to take a closer look at your preferred model. Why are your prices so much less than the other bigger companies? We sell our sets directly to you! This approach eliminates the incremental costs of delivering through a dealer network. When you buy directly from us, you can save 30% or more buying factory direct. What type of wood does Kid’s Creations use? Our Redwood models are 100% California Redwood. Many of our competitors use a mixture of wood species in their “redwood” swing sets. Kid’s Creations also has a new product line made from imported Cedar. What do I need to know about California Redwood? California Redwood is known for its rich beauty, natural decay resistance and long-lasting performance. Redwood is less likely to warp, split, cup or check than other wood. With redwood you get both natural beauty and quality performance. What do I need to know about Cedar? Our imported Chinese Cedar is naturally decay resistance. The small knot structure and excellent stability make it a great alternative to our redwood swing sets. Checking is considered small cracks along the growth ring wood. This occasionally happens during the harvesting and drying process and is considered purely aesthetic. Where is your manufacturing plant located? 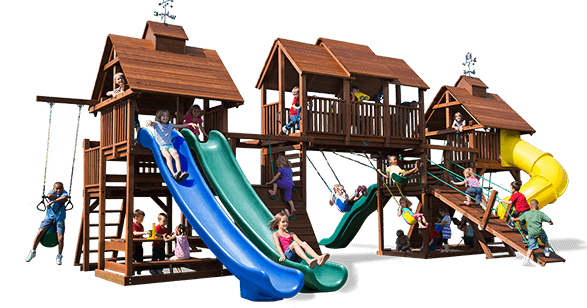 We proudly manufacture our redwood play sets in Monroe, Michigan. Do I need to stain my set? All of our swing sets are factory stained. Our models are constructed with DIY consumer in mind. All material is pre-cut, pre-drilled and ready for assembly. The speed of assembly will depend on the consumer’s experience and comfort level. Kid’s Creations offers swing set installation services in selected areas if DIY is not the preferred option. How is my set delivered? Once your set is built and ships from our shop in Monroe, MI. The delivery company will contact you to schedule a delivery date and time. The typical swing set comes in multiple bundles/boxes. Some larger packages may need to be opened and hand offloaded to the ground. How far away does my swing set need to be from other objects? ASTM guidelines recommended a 6ft. safety perimeter around your play set as well as overhead. Am I responsible for making sure I can build a play set in my backyard? Yes, the customer is responsible for complying with any Homeowner's Association regulations and restrictive covenants. What ages are your play sets and accessories recommended for? Our swing sets and accessories are intended for use by children ages 3 to 11 years. I own a business. Can I purchase one of your play sets? Our swing sets are designed for residential use only. Does your lumber used adhere to the sustainable forestry practices? Yes, we only use lumber suppliers that adhere to strict quality and harvesting standards. Trees are planted or managed to ensure that the forests are continuously renewed. Send us an email or chat with us online. Feel free to give us a call at 855-853-8556 too!